Here at Parker Pumps we supply a wide range of pumps from many manufactures. Our range extends from low priced economical pumps through to high quality, long life pumps made by the best manufacturers in the world. We not only sell pumps, we service and repair all brands of pumps. We can service on site or in our workshop. We have extensive knowledge of tank to mains systems and are able to service all brands of these. We aim to be able to maintain your pumps in good working order, whether it is for the back yard, house, farm or industry. Our wide range of knowledge allows us to offer you the customer an economical service and to maintain your pumps in a reliable condition. The business originally started in the early 1960’s as James Nott & Son. This was later purchased by Gordon Semple and changed names to Semple’s Pump Centre. 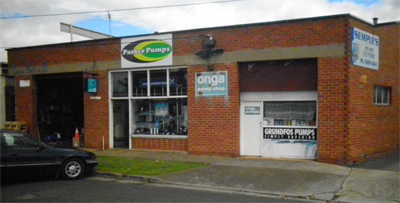 With Phil Parker purchasing the business in the late 1990’s the business has recently changed name to Parker Pumps. We have been on the same site for all these years and we offer good old fashioned service and product knowledge.